Martha sheds light on the wide world of legumes, exploring the many available varieties — from chickpeas to calypso beans — and how to cook them using three different methods: stovetop, oven and pressure cooker. Italian chef and bean aficionado Cesare Casella joins Martha to share some of his own recipes for exceptional bean dishes. Martha Stewart sheds light on the wide world of legumes, exploring the many available varieties. Martha Stewart is joined by Cesare Casella, and they discuss preparing beans. 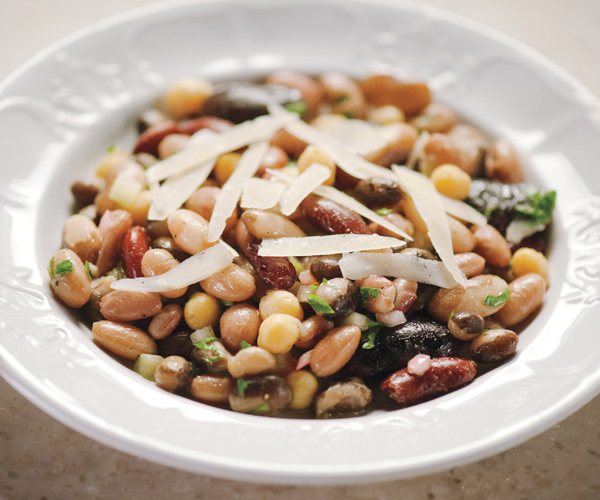 Make Martha Stewart's seven bean salad from the "Legumes episode" of Martha Stewart's Cooking School. Place red onion in a small bowl with enough red wine vinegar to cover. Let marinate for one hour. In a medium bowl, combine beans, celery, and parsley. Drain onion and add to bean mixture. Drizzle with olive oil and enough vinegar to taste. Season with salt and pepper. Toss until well combined. Salad may be eaten immediately or refrigerated up to a day. Just before serving, shave thin slices of Parmigiano over each portion.